This graphic depicts the trackable objects, satellites and space junk, in orbit around Earth. The United States needs to team up with other countries and the private sector to track the huge volume of potentially dangerous space debris circling the Earth, according to a U.S. military official. 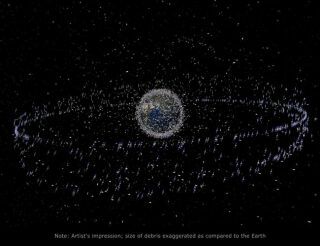 More than 22,000 pieces of space junk are being tracked today as they zip around our planet, posing a collision threat to valuable satellites and other spacecraft. But there's far too much of the stuff for the U.S. government to keep track of on its own, so cooperation is required to improve the country's space situational awareness (SSA) capabilities, said Lt. Gen. Susan Helms, commander of the U.S. Strategic Command's Joint Functional Component Command for Space. Helms articulated the need for cooperation at the Sixth Annual Ilan Ramon International Space Conference in Tel Aviv, and again shortly after she returned to the U.S. last month. Her statements echo recommendations laid out in the U.S. National Space Policy, which was announced by President Obama last June. A key component of SSA is tracking and cataloguing objects in space, which help prevent collisions with spacecraft. However, with 22,000 pieces of trackable space junk and more than 60 nations operating in space, the U.S. will have a tough time going it alone, officials said. "It directs us to collaborate with other nations, the private-sector and intergovernmental organizations to improve our space situational awareness — specifically to enhance our shared ability to rapidly detect, warn of, characterize and attribute natural and man-made disturbances to space systems," Helms said. The National Space Policy is essentially a vision document. As a result, it's a little short on specifics about how exactly to develop and maintain the necessary partnerships, officials said. "There are many technical and operational details that have to be worked out before we at JFCC-Space could begin incorporating data from allies and partners, but we are definitely moving in that direction," Helms said. These partners aren't limited to other sovereign nations. JFCC-Space currently has 19 SSA sharing agreements with private industry to help support safe space-flight operations, officials said. As a result of this data sharing, satellite owners maneuvered their craft 126 times last year to avoid collisions with other satellites or on-orbit debris. "The United States is committed to safe, responsible and peaceful uses of space," Helms said. "Public provision of space situational awareness data through the SSA Sharing Program is evidence of the U.S. government's commitment to provide SSA data to the world, free of charge, in order to enhance safe and responsible space operations and promote transparency."